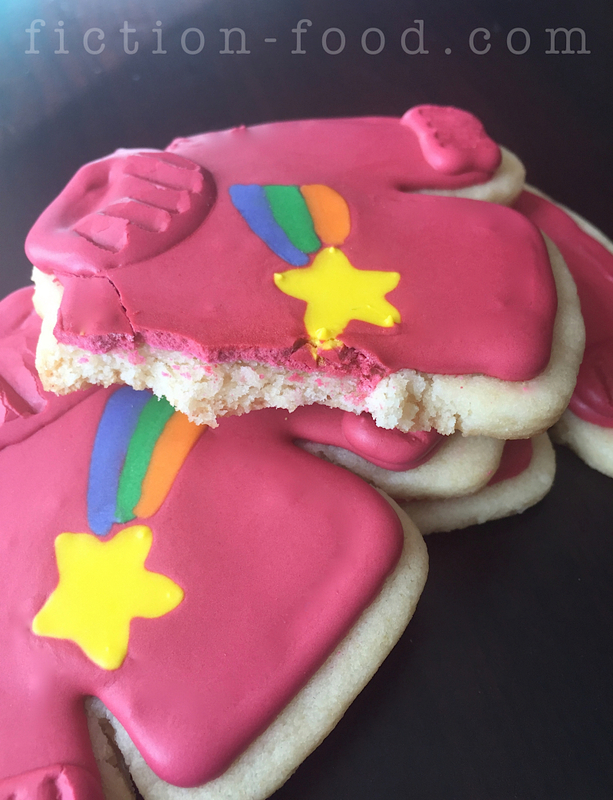 Fiction-Food Café: Mabel's Sweater Cookies for "Gravity Falls"
Mabel's Sweater Cookies for "Gravity Falls"
like it's been forever! 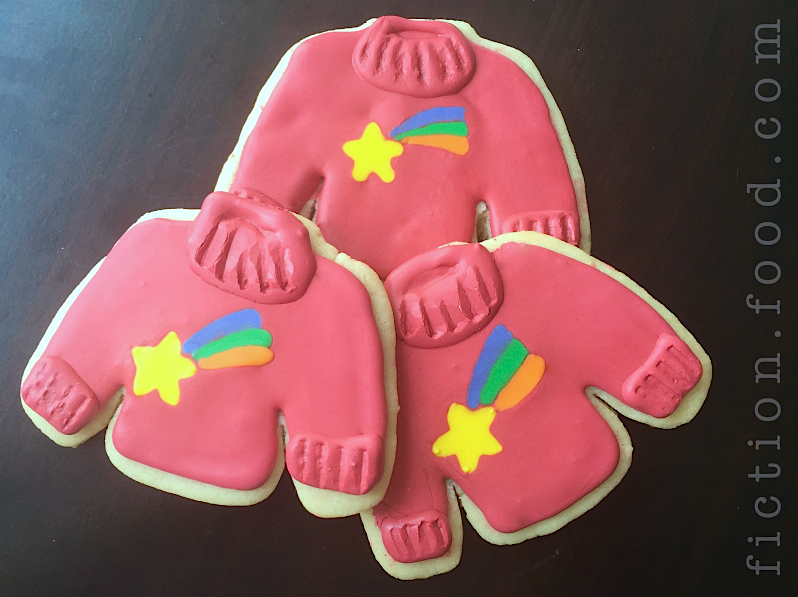 even though we did have one episode last month), I took my first step into royal icing cookie decorating and made some cookies that I've had in mind for a good while now: Mabel's sweaters! I definitely need more practice, but this first try has given me confidence to do more decorating with royal icing in the future (the ideas, they just won't stop!). 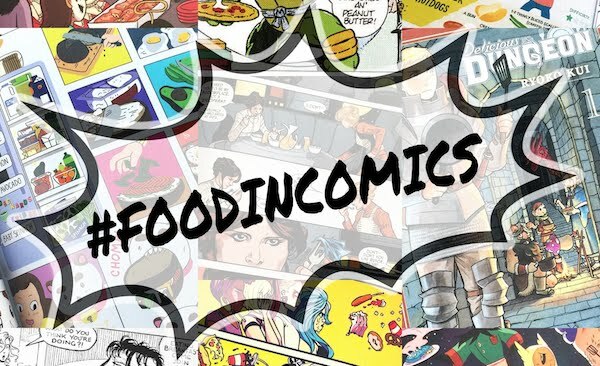 Note: You can separate a portion of the icing below & make it black to outline the sweaters (using a #2 icing tip), to give it more of a cartoon look. You can use the black to outline the collar too, as well as the ribs–or collar lines–and then fill it in with a little pink. I'm going to make these cookies again at some point and give the black a go, and then post another picture or two so you can see. You can also make more colors to make different Mabel sweater designs (lord knows there are plenty to choose from!) 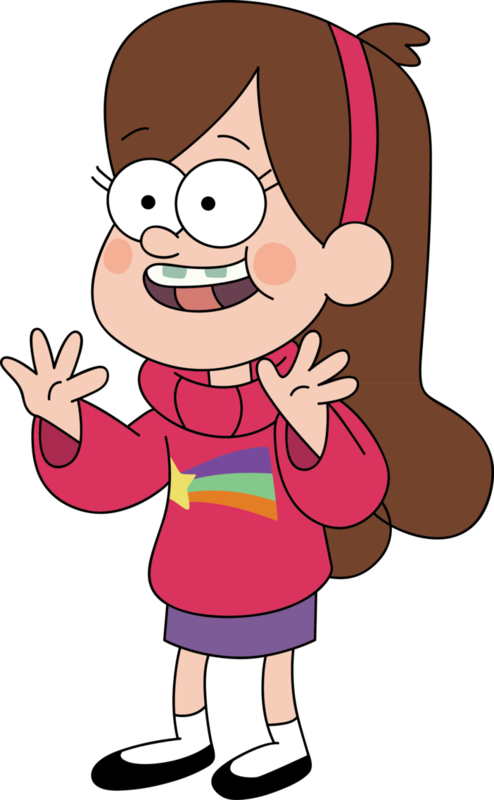 but I wanted to keep it simple for my first time and go for the most memorable/common Mabel sweater. 1. Cookies: Preheat your oven to 375ºF. If making homemade cookies, make as directed. If using a package mix, whisk together the cookie mix & flour & then add in the butter & egg until fully combined, soft dough forms (you can stir or use a stand mixer). Roll the dough out to 1/4" thickness on parchment paper. Cut sweater shapes at least 1/2" apart & remove the excess dough to roll out for the second batch. Place the parchment with the cutouts on a large baking tray & bake for about 5-6 minutes or until just beginning to brown on the bottom. Carefully lift the parchment paper up by opposing corners & place on a wire cooling rack or towel to cool. Roll the rest of the cookie dough on another piece of parchment & repeat the process. Let the cookies cool completely before decorating. 2. Icing: Mix all of the royal icing ingredients together with a hand mixer or in a stand mixer until the icing is glossy, smooth, & a pipe-able consistency (add more water, a little bit at a time, if it's too thick). Scoop out about a cup & a half to a separate bowl & cover what's left in the mixing bowl with a damp towel. A little at a time, squeeze drops of red & pink, with one or 2 drops of purple, into the icing you scooped out, until you get the dark pink, magenta-ish color of Mabel's sweater (see pictures). Snip the tip of one of the decorating bags & attach the #3 icing tip with the coupling parts (base & ring). Put a piece of tape over the hole of the tip. Put the bag in a tall cup, icing tip down & fold the opening of the bag down. Scoop the dark pink icing in & then fold up the edges & twist. Separate the remaining icing into 4 small bowls & color 1 yellow, 1 purple, 1 green, & 1 orange. Just as you did for the pink icing, prepare a decorating baggie with the #2 tip & scoop in the yellow icing. 3. 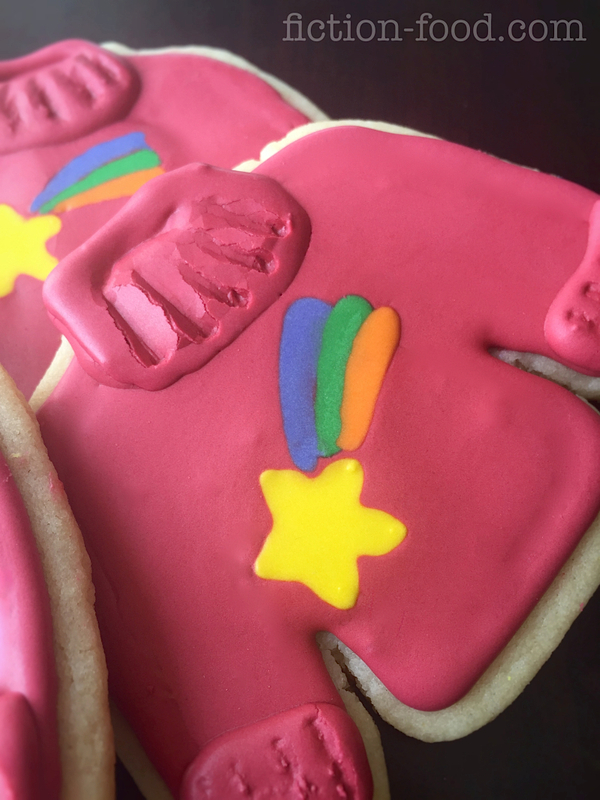 Decorating: Using the pink icing, outline 1 cookie at a time, leaving a little space around the edge, & then fill the outline in, using a toothpick to push the icing around to fill in any spaces. 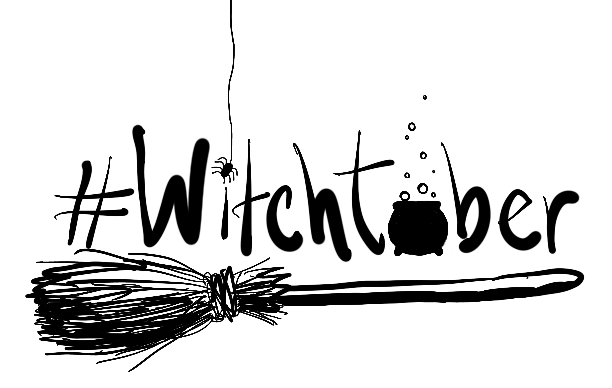 While the icing is still wet, carefully pipe on a yellow star, using a clean toothpick for fine tuning if needed. Next, dip another clean toothpick into the purple & carefully draw a curved line from the right side of the star (see pictures). In the same manner, make a line of green under the purple, & then a line of orange under the green. Repeat these steps until all of the cookies are decorated & then let them sit for about 10 minutes or so to harden a little. 4. Use the pink icing to pipe on a collar & sleeve cuffs (the cuffs are optional) for each sweater. Let the icing sit for about 5 minutes or so & then use a toothpick to gently press indentation lines on the collars & cuffs to give them a ribbed effect. Let the cookies set for 30 minutes or so before serving or gifting.